A Big Big thank you to the Members Community Leadership Scheme fund for the cheque of £400.00 which we received at our Parish Meeting, from Cllr Judith Twigg. The funds are going to be put towards a new Village Hall notice board. The notice board will be in memory of John Herbert and all the work he did for Sheldon during his time as Chairman of our Parish Meeting. Derbyshire Dales District Council have provided a calendar showing the refuse collection dates for the village. It can be found here in PDF format, and under the Parish Matters menu link at the top right of this page. 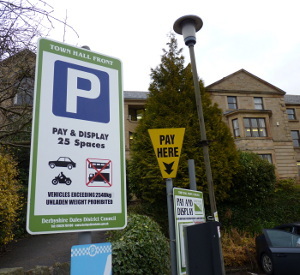 Derbyshire Dales District Council began a detailed review of its car parking policy at the end of January this year. Feedback from local residents, traders and groups has helped shape a series of new ideas. So far, the consultation programme has included: three community forums, discussion at the Derbyshire Dales annual Parish and Town Councils conference, and meetings with traders, residents and disability groups. Partner agencies have also been asked for their views. Having listened to what people have told the District Council, they are now ready to consult on proposed changes to their car parking policy. The consultation will run until 21 June 2013. The District Council will then meet on 25 July to consider the results of the public consultation and endorse a new car parking policy.